"Challenging" and "rewarding" best describe the Rescue Diver course. Building upon what you've already learned, this course expands on what you already know about how to prevent problems, and how to manage them if they occur. This is not a Public Safety Diver program, but is designed to help every diver prevent and or resolve diver incidents. Our Rescue Diver knowledge development portion includes all materials required to complete the Rescue Diver course – including a pocket mask. 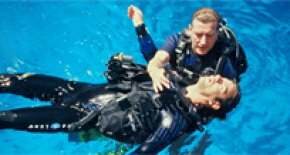 You'll learn how to think like a rescue diver and preview skills you'll practice with your Instructor. Once your Rescue Diver course is complete, you can review the digital material to refresh your dive safety skills as needed. This tool box of knowledge and techniques will give you the expertise to handle almost any emergency situation. Have a have a qualifying certification from an approved organisation. Be trained and current for first aid and CPR within the previous two years (Ask your instructor about CPR and first aid courses) as well as Oxygen Provider. After completing Rescue Diver you will be well on your way to becoming a Master Diver or starting your professional training as a Dive Guide.